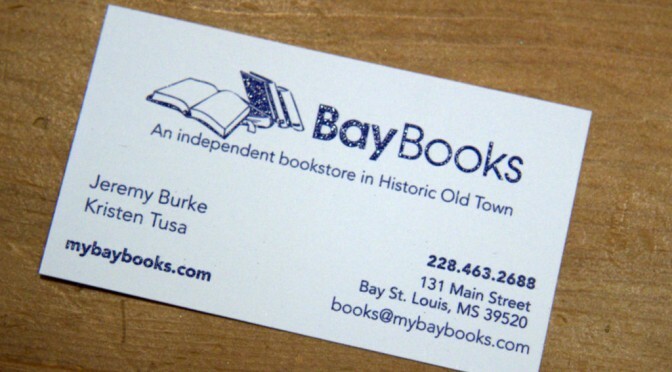 Jeremy Burke can often be found behind the desk of Bay Books at 131 Main Street in Bay St Louis, MS. Jeremy and Kristen run a small but well read bookstore. They have a real understanding of what books match each age group and even what books are popular or controversial. Bay Books offers lots of local book signings throughout the months. Having a store like Bay Books is a real treasure. I know many local frequent the shelves looking for the perfect gift for their loved ones. Most days you will find Jeremy ready to help you find the perfect book. Bay Books has an amazing children’s section with books, toys, games and puppets. Bay Books is a must visit place in Bay St. Louis. See what book Jeremy will recommend for you or just figure out where he is hiding Waldo in his store.